It is somewhat ironic, given that the name ‘Hornby’ equates with model trains, that when the company acquired Airfix in 2006, items that were not included in the purchase were railway trackside buildings and accessories, which had been sold to Dapol in 1985. The exception was the Airfield Control Tower as, although it started off as a trackside accessory, it had been - probably logically - moved to the aircraft section of the catalogue before the Hornby sale! You get a one-piece resin moulding, with separate window frames and acetate glazing. Note the sturdy expanded-polystyrene packing. Actually, the control tower is a good example of the fact that these buildings were not the sole prerogative of rail modellers. As they were 1:76 HO gauge, they would certainly fit alongside 1:72 aircraft, AFVs and the like, plus the parts could be widely adapted to other uses - hence many an Airfix Girder Bridge part turning up in science fiction spaceships, built for film and TV. Painting instructions are on the back of the box. 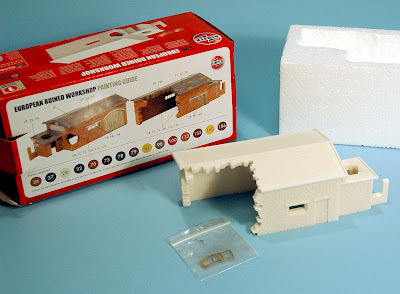 Although Airfix no longer has this staple of its original range, in recent years it has introduced ‘Ruined Buildings’ as a variation on a theme, although these, due to their name and state, have a specific role for wartime dioramas. 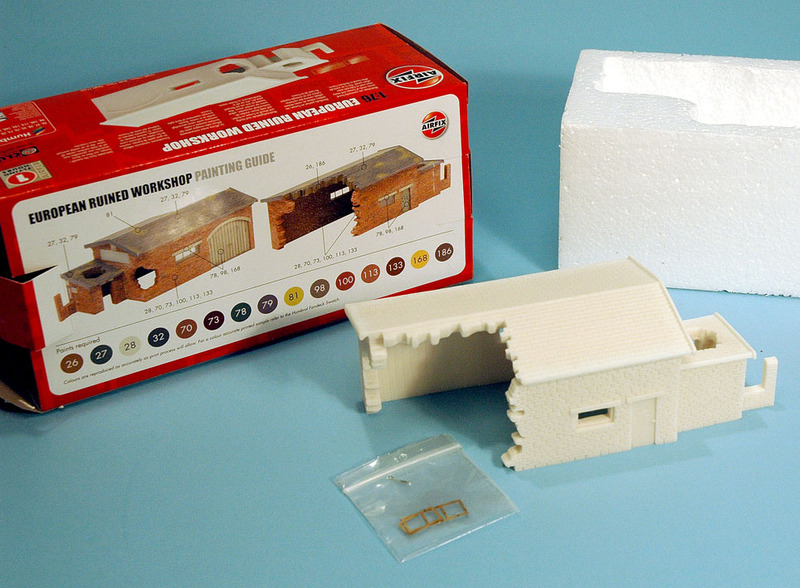 There is also a difference in that they are not moulded in polystyrene, or come as standard construction kits. Instead, they are ready-made in resin with only window frames (in etched brass) and windows (in acetate) being separate items. However, they do need to be painted, which is usually where the fun begins with these types of model anyway. My finished Ruined Workshop in a World War II setting. Given that they are ready-made, there are no separate instructions, just painting details printed on the boxes. 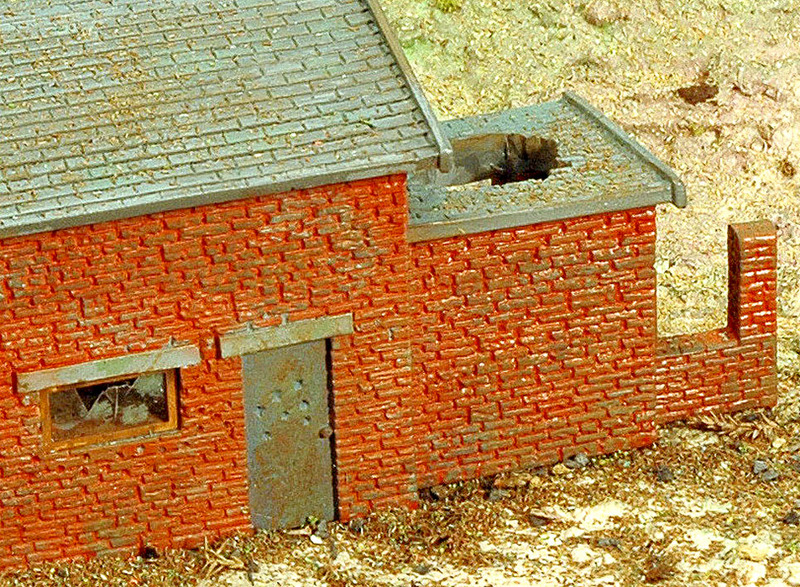 The example shown here is the European Ruined Workshop, which is depicted as it might have appeared in northern France, but frankly could be just about anywhere that a brick structure would look appropriate. The state of the building could also be purely down to wear and tear, not necessarily being hit by shells, which gives it an even wider use - in a modern scene, for instance. Neat figures and Citroen car bring the scene to life. 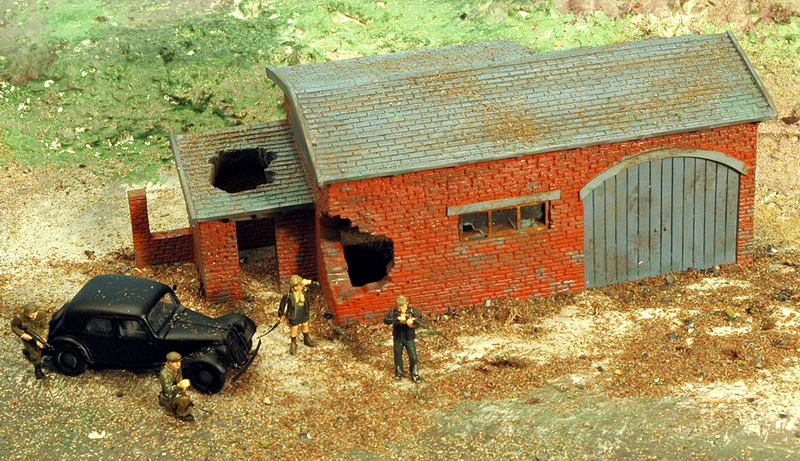 I built a World War II diorama, in which the building features as a hideout for French Resistance partisans, while they prepare to meet an RAF Lysander on a spy-delivery mission. I included a classic Citroen 11CV Traction Avant, just the sort of car Resistance fighters often used. This 1:72 scale cast-resin model comes from the Czech company, Extra-Tech. The figures are from the WWII Underground Resisters (sic) set, by Caesar Miniatures. It’s worth pointing out that this is marked as discontinued, so you may have to hunt around to find a set still available - it's worth doing, as the figures are neatly sculpted, and look suitably realistic, especially as a female is included. Detail is good, even including pockmarks in the door. It could be improved at a later stage by adding rubble around the damaged walls. See the Extra-Tech Citroen 11CV here.